Tony BARNARD and ALL HAT JAZZ: Archival Performances. Tony Barnard and I had known each other for around three years or so when he asked me, in mid-1988, to join his quartet for their Sunday afternoon residency at Balmain's famous Unity Hall Hotel. My first gig with the band was May 29, 1988. The band on that particular occasion consisted of Tony on guitar, his younger brother Adam on drums, John Ryan on bass and Alan Davey on trumpet & flügelhorn, plus myself on the odd vocal. Alan had replaced original member Andrew Speight (now living and working in the United States) and John Ryan was deputising for the band's 'real' bassist, David Ellis who was away working with one of the orchestras that he performs with. 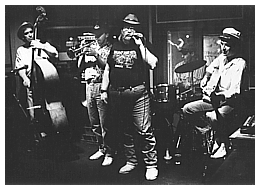 The band held the residency until around April 1993, as near as damnit to 5 years and attracted a regularly full house consisting of jazz fans, blues fans, musicians, well-known actors and celebrities in general out to join in the music and the fun to be had every week! Sadly, a number of those who came to play including John Ryan, Maddy Young, Rolf Stübe and Tom Baker, are no longer with us. But all will be remembered with great love and fondness along with some of those who just came to listen and are no longer here!